Forty years ago when I had just moved “back to the land” in Northeast Washington, I picked fruit in the fall to support my family. I saw tons of fruit, often the ripest and tastiest fruit, go to waste because it would not ship well, was in an abandoned orchard or was only used for pollination. Finding ways to save this bounty got me started making wine. These “country” wines tasted good and were popular with my friends. But they required adding sugar to make them sweet enough to ferment fully. If the wines themselves were too sweet, you could easily drink too much and wake up with a headache. When I moved to Rice, Washington, in 1986, I got some grape plants from a friend and started a vineyard. I discovered that I loved growing grapes. You make wine out of grapes because they get twice as sweet as most fruit. Not only do you not need sugar, it is considered very bad form to add it to grape wine. Over the years I have come to believe that refined sugar is a poison. I also found that nearly all of the chemicals often added to wine, or used to control pests and weeds in the vineyard are both unnecessary and poisonous. So I learned to grow grapes and make wine organically and without sulfites. Soon I also realized that I was making a lot more wine than our family could drink. So I went through an incredible series of bureaucratic hurdles to license Barreca Vineyards as a winery. Our winery is not a micro-winery. It is more like a nano-winery. We have 6 or seven varieties and blends of mostly red French Hybrid wines. They are all pure, simple and made from our own grapes. But we don’t suggest that you buy them because they are politically correct. We invite you to try them and buy them because you like them. I love growing grapes. We have around 30 varieties. Many are seedless table grapes and we sell young grape plants started from these. But most are wine grapes that get a lot of attention before and after they are picked. We invite people to try our wines and hopefully buy them, but we also invite you to grow your own grapes and make your own wine. No two wine makers will agree on everything. There is always a lot to learn and to talk about. We are no longer open Saturdays but you can always call to make an appointment for a tasting for yourself, friends and family, 509-738-6155. 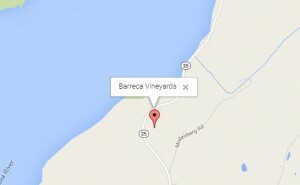 You can get here using the following map: Map to Vineyard.